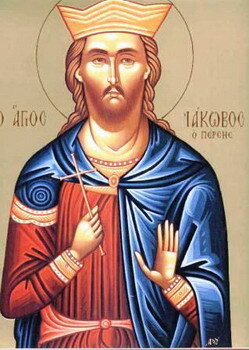 The Holy Great Martyr James the Persian (the Sawn-Asunder) was born in the fourth century into a pious Christian family, both wealthy and illustrious. His wife was also a Christian, and the couple raised their children in piety, inspiring in them a love for prayer and the Holy Scriptures. James occupied a high position at the court of the Persian emperor Izdegerd (399-420) and his successor Barakhranes (420-438). But on one of the military campaigns James, seduced by the emperor's beneficence, was afraid to acknowledge himself a Christian, and so he offered sacrifice to idols with the emperor. Learning of this, James' mother and wife wrote him a letter, in which they rebuked him and urged him to repent. Receiving the letter, James realized the gravity of his sin. Faced with the horror of being cut off not only from his family, but also from God Himself, he began to weep loudly, imploring the Lord for forgiveness. His fellow-soldiers, hearing him pray to the Lord Jesus Christ, reported this to the emperor. Under interrogation, St James bravely confessed his faith in the one True God. No amount of urging by the emperor could make him renounce Christ. 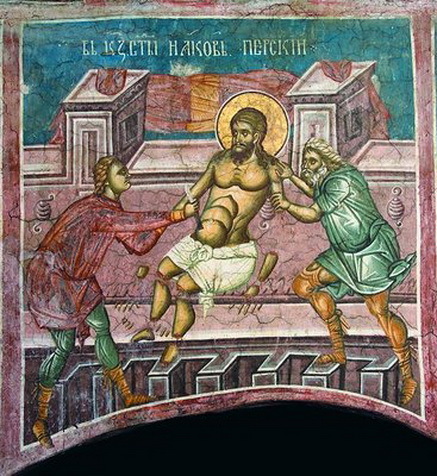 The emperor then ordered the saint to be put to death. They began to cut off his fingers and his toes one by one, then his hands and his feet, and then his arms and legs. During the prolonged torture St James offered prayers of thanksgiving to the Lord, Who had granted him the possibility of redemption from his sins by enduring these terrible torments. Finally, the martyr was beheaded. Christians gathered up the pieces of his body and buried them with great reverence. You astounded all, long-suffering James, by enduring horrible tortures with great patience. you uttered prayers of thanksgiving to the Lord. and came to the throne of the heavenly King, Christ God. Entreat Him to save our souls! accepting the cutting of your body as though you were a vine. Therefore you were revealed as a martyr worthy of honor.